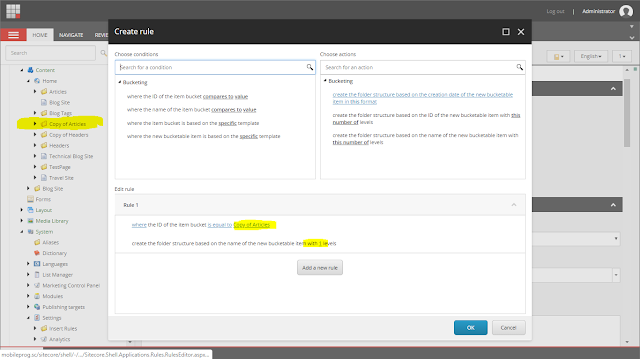 When you are bucketing items in Sitecore, by default it will be reorganized all child items by creating folders according to datetime order in year, month, day, hour, and minute. But what if you want one datetime order at one place and for some other items you want all child items should rearranged in alphabetic order or may be by creating folders according to GUID characters. 2. Create rules by selecting a condition and an action. Here action specifies the bucket folder structure. Only bucket items that match the condition will use the action. 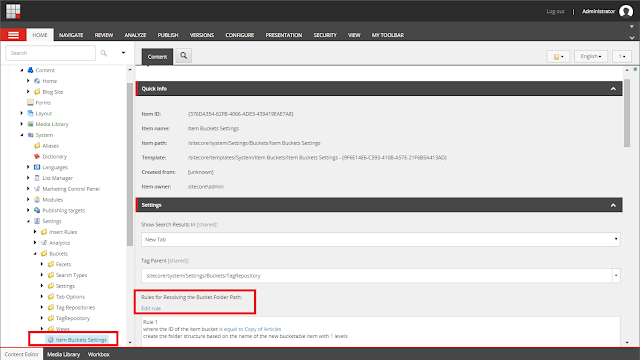 Now you have bucketing structure according to datetime and alphabetic order in one Sitecore instance. However you can create any number of such ordering by using such rules. Isn’t that a cool feature??? This post is about lifetime and publishing fields of an item in Sitecore. If you check standard values of any item, you surely get two section - Lifetime and Publishing. These fields are applied on individual version and language. Valid to - After this Date and time, this item version is removed from delivery database. Hide version - Hide this item version from accessing. Its useful if you have created multilinguaal site and for specific language such as French, you don't want to publish it. So check this checkbox to hide French language version. All fields of publishing section are shared. These fields are applied on all versions and languages of an item. Publish - Copy this item at specified datetime to web(delivery) database. Never publish - Don't publish this item. In this case item will not copied to your Web database. If item is already published, then this item will be deleted from WEB database. If you had not published the item yet and now if you specify the datetime in Publish field and marked Publishing targets, then item will be automatically publish around specified date time on specified target delivery instances. Please note this will not published at exact specified date time but somewhere after to specified date time when publish agent will run. I hope you like this Sitecore lesson. Stay tuned for more Sitecore related articles. 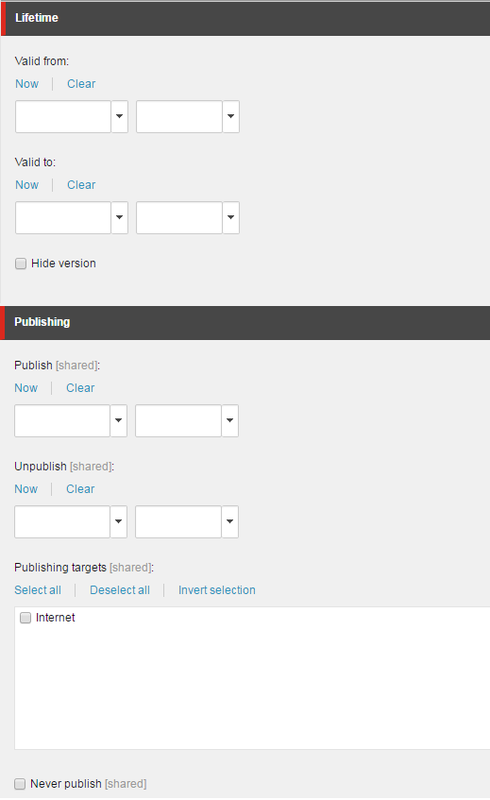 I just love the way Sitecore allow me to customize its UI, change look and feel, override pipeline etc. 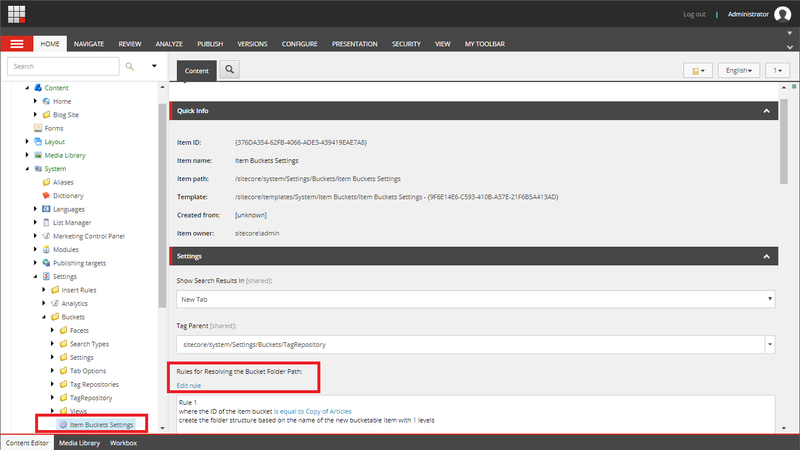 Sitecore provides a web UI to user which is ultimately HTML for browser. So everything that is applicable on HTML is also true for Sitecore UI. 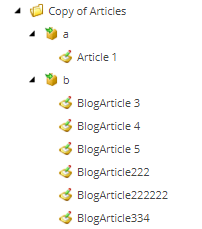 There are some important items present in content tree which we need to show to content editor in different format. So sometimes we need to change look and feel of these item in content tree. Content items in tree are actually <span> inside Hyperlink HTML tags. Put you CSS style into "Style" field. I hope you like this Sitecore customization lesson. Stay tuned for more Sitecore related articles.